I always thought these were really cool but they were always sold out wherever I looked; however on my travels to Bluewater the other day I saw a whole batch of them in the G4 gadget shop and had to buy one! They are a really cool little gadget for anyone that doesn't take life too seriously. Mine is currently residing on my desk at work and it is a really good finishing touch. There is a whole collection too! Some of you may have seen the Voodoo Knife Block in our gifts for him section and there is also 'Splat Stanley' mug holder. 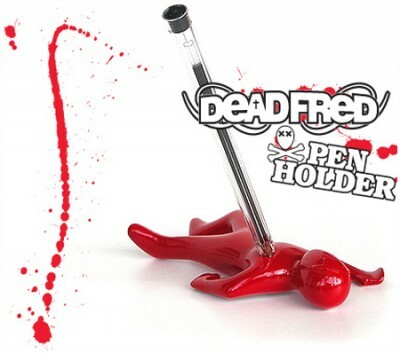 Get your own Dead Fred!